Ancient history, it's woven into the very fabric, that is Britain. This particular pattern has been looked at, far more, from a mythological stand-point, now, I think it is perhaps time to look at it from it's historical stand-point. The peoples that followed the ancient ridgeways, existed, they lived and breathed, the same way as we do, now. They were not gods or goddesses....they were human. Below, is the subject and episode synopsis of the British TV series, Ridgeriders, that has been playing for the past five years, and gives you a very good idea about what the programme was all about. If you are a history buff, or a motor cycle buff, this page is for you. Alas the series is no longer being made, the Albion Band and The Ridgeriders Band are no more, but the memories live on in our hearts and minds, and as long as we have these things, so shall they and the landscape of Southern England be eternal. 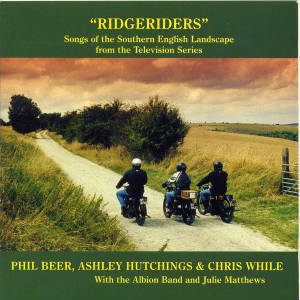 RIDGERIDERS, which follows the ancient trackways of the South of England. Britain since the Stone Age, many of which they have had special permission to use. En route, the explorers discover treasures such as Roman, Bronze Age and Iron Age relics. They also meet the people who can explain their significance. In the first programme of this seventh series, Nick is joined by Penny Mallory from Channel 4's Driven, and Radio 1 DJ Kevin Greening. Together they ride the Eastern Ridgeway of the Isle of Wight. Their journey begins at Priory Bay, where they see evidence that Stone Age hunters were in the area around 100,000 years ago, before the Island or even Britain existed. From there they visit St Helen's tower, all that remains of the Norman church, before wending their way up onto the Downs and the 19th century Bembridge Fort, built to withstand a French invasion that never happened. Passing the Bronze Age burial grounds on Culver Down, Nick, Penny and Kevin head for Brading Roman Villa, where museum manager Neville Carr tells them of a gruesome discovery down an old well, and shows them some unusual Roman artefacts. "I love this Roman stuff, I can't get enough of it," says Penny Mallory. "I would love to be transported back in time and be here when it was first built and see what life was like." Kevin adds: "I hated history at school. Why couldn't my teachers have been more like Neville........School should be for adults I think. They should make kids work and when they get older they go to school and learn the real stuff." On Brading Down they meet Vicky and Frank Basford, who love the Island for its history and its archaeology. "We like to think the Island is a special place......it's part of the Wessex region," says Vicky. "We don't have some of the really rich goodies of the area around Salisbury, but it's the same kind of culture and the same kind of landscape." The last leg of the RIDGERIDERS journey takes them through a landscape that 10 million years previously would have been covered by a forest of tree ferns, and good dinosaur country. relates the history of the house, including the scandal of the lord of the manor, his wife and her 27 lovers! Programme Two: on Meridian on Thursday 14 June at 7.30pm. county bridge at Witchampton before heading straight down a Roman road to finish the day at the Iron Age hill fort of Badbury Rings. Programme Three: on Meridian on Thursday 21 June at 7.30pm. Horsebridge, and to their final destination of the mediaeval Clarendon Palace. Portsmouth. The RIDGERIDERS pass through Milbury, Warnford, via Old Winchester Hill Fort to Butser Hill, Hambledon and to Portsmouth. The Ridgeway runs from Avebury in Wiltshire to Ivinghoe Beacon in Buckinghamshire. The trail follows part of an ancient track established by prehistoric man that stretched across the country from Dorset to Norfolk. It passes through two distinct landscapes. The western half of the trail, from Avebury to Goring, follows a broad track along the North Wessex Downs, with far-reaching views over rolling open downland to the south and the wide expanse of the Thames Valley to the north. The eastern half, from Goring to Ivinghoe Beacon, begins by following the banks of the River Thames before heading into the Chiltern Hills, through a landscape of beech woodlands and fertile farmland dotted with attractive villages and towns. The Ridgeway has a long and rich history. Stone Age man left the long barrows at West Kennet, Waylands Smithy, and Whiteleaf Hill as well as the extraordinary stone circle at Avebury and Silbury Hill, the largest man-made mound in Europe. 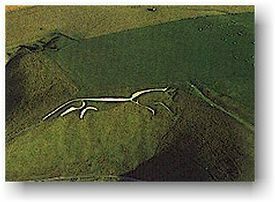 Bronze Age people left the round barrows that litter the route and the Uffington White Horse, one of the most famous hill figures in the country. Grims Ditch and vast hill forts including Barbury, Liddington, Uffington, Segsbuy, Pulpit Hill and Ivinghoe Beacon were built during the Iron Age. In the Dark Ages The Ridgeway was the main route for the Saxons and Vikings during their advances into Wessex. From medieval times until about 200 years ago, it was drovers moving livestock, rather than armies, who used The Ridgeway. 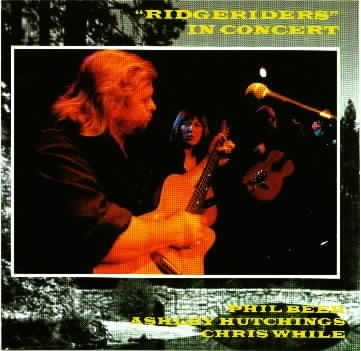 Recorded at Tone Deaf Studios, Preston, and at Central Studios, Southport, in 1999.
and please visit our Ridgeriders website which you can get to here or via the album cover just above this text.